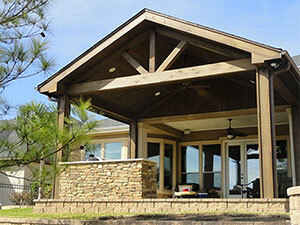 Woody WoodDeckers builds custom wood decks, pergolas, covered patios, gazebos and more. We serve The Woodlands, Spring, Tomball, Magnolia, Conroe, Montgomery and North Houston, Texas. Beautiful, custom-built decks and pool decks to complement your home and enhance your yard. A perfect addition for entertaining guests and spending time outdoors. 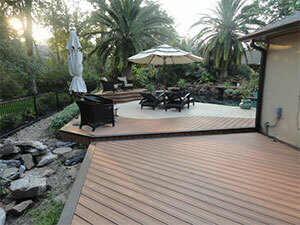 Choose from a variety of decks such as Trex composite, cedar, IPE, wood and more. 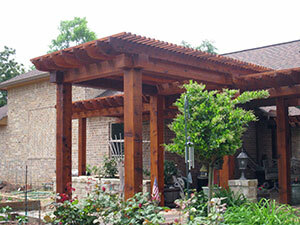 Create just the right amout of shade for your outdoor living area with a custom designed pergola. We will create a style that complements your home, backyard or pool. Designed around the exterior of your home, we will build a seamless structure that can include features of your choice such as lighting, fans, outdoor kitchen, fireplace and more. 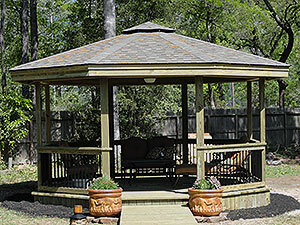 Relax in the shade and comfort of a beautiful gazebo built with a custom design and railings. Rich was great, he had the experience I was looking for with Trex decks, was very personable and accommodating, and produced a lovely deck that is exactly what I asked for! I'd gladly recommend him and his crew. Rich Woody has done 4 projects for us (3 major and 1 small). His jobs are great, the job site is left immaculate and completed as promised. Our arbor is 5 years old and no problems with warping. Honest and trustworthy. What more could you want! Rich is a people person! When you talk he listens to what you want built. He is also a Christian and that is a plus in our book!